When you install Orchard 1.9, the first thing you might notice is that the Page content type no longer contains a BodyPart by default. Instead, it now has a LayoutPart. Make no mistake, the BodyPart is still absolutely relevant, that will not change. 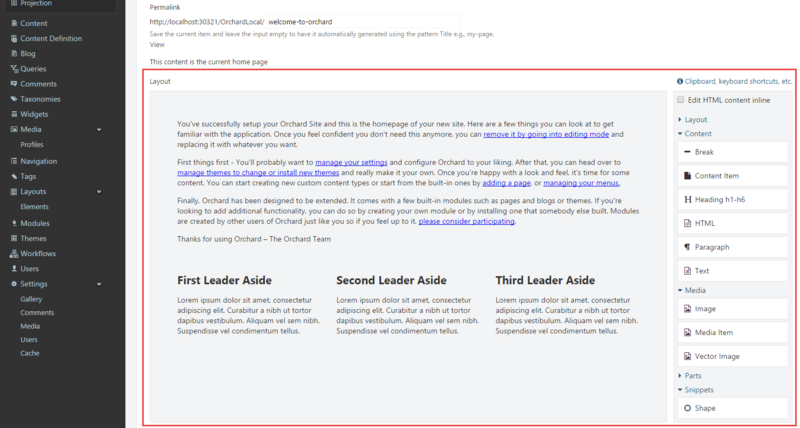 Experienced Orchard users typically design their own content types, and the BodyPart is a very useful part to represent a type with a body of text. What you see above is the layout editor used to layout the homepage. By default, the Page doesn't have a BodyPart anymore, but a LayoutPart which is responsible for rendering a layout editor. A layout is a hierarchical collection of elements, such as Grids, Rows, Columns, Html, Markdown, Paragraph, Image, and more. And Orchard wouldn't be Orchard if you wouldn't be able to extend thhe list of elements with your own elements. The following is a high-level overview of all that Layouts currently has to offer. 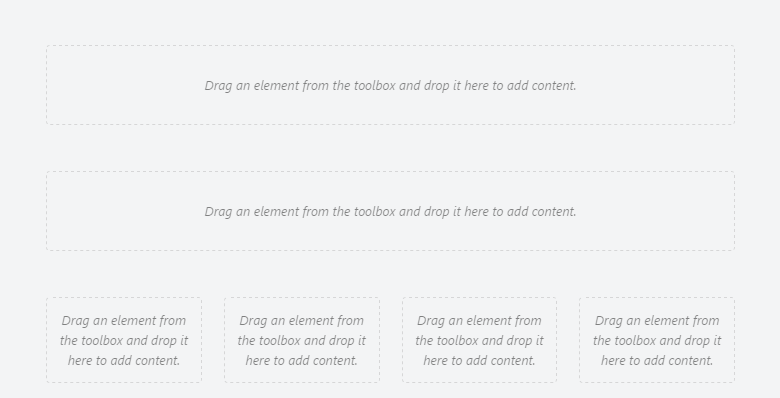 A LayoutsPart to turn your content types into content items with a layout. A LayoutWidget that enables you to add layouts to any zone. An ElementWrapperPart that lets you turn any element into a widget. The idea here is that we want to move towards an element-first approach, so that whatever elements you develop, they can be used within a layout as well as within theme zones as widgets, reusing the element's logic and data. This content part is what enables the following additional widgets added to the system: Content Widget, Media Widget and Text Widget. Each of these widgets don't have any specific parts, but rely on an element as their "nucleus". 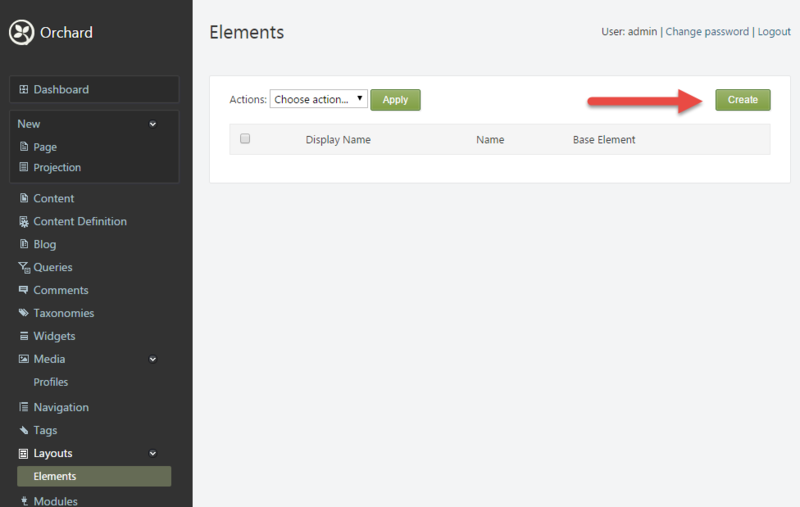 Element Blueprints are preconfigured elements that the user can create through the dashboard. Layout Templates enable the user to define a set of layouts that can be reused. Think ASP.NET Master pages. Snippet Elements, which are elements created in the form of Razor templates, which live in the theme. For example, if you create a Razor file named CompanyLogoSnippet.cshtml in your theme and enable the Snippets feature, your template will be available as an element called "Company Logo". 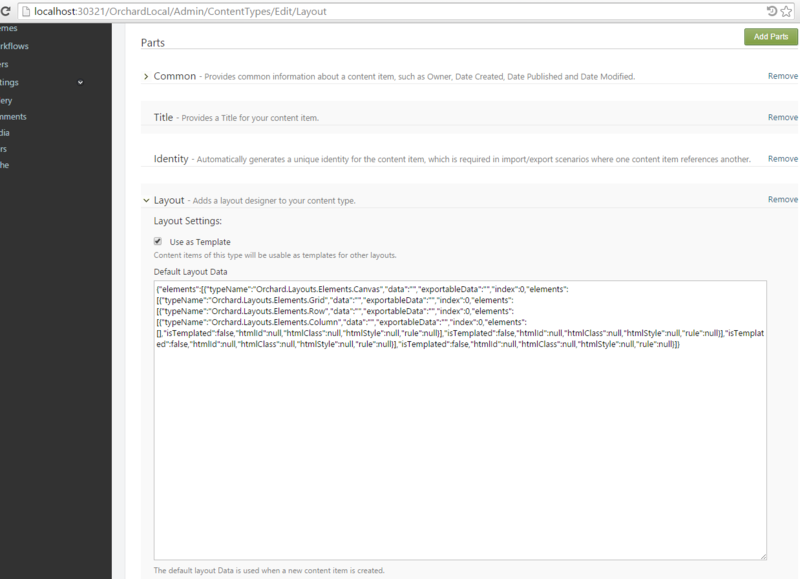 ContentPart and ContentField elements. 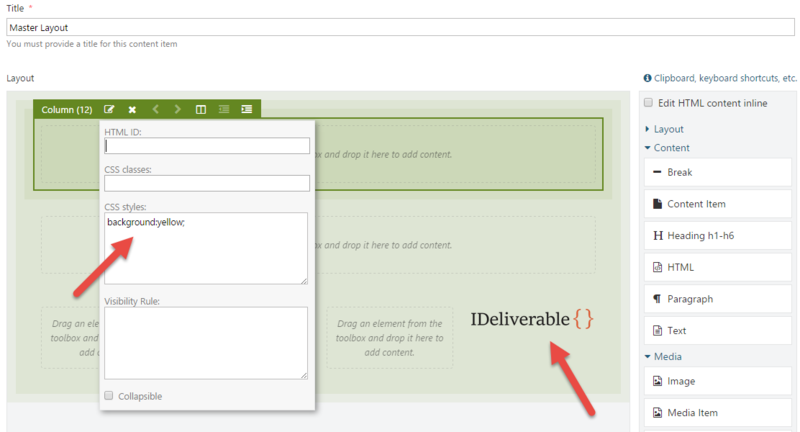 This enables you to place the content parts and fields attached to your content type anywhere within the layout. Think Placement.info controlled via UI (although Placement.info has nothing to do with it, other than disabling the default rendering of these shapes). All elements share a common set of properties, such as ID, Css Class and Inline Style. Elements are turned into shapes for rendering. 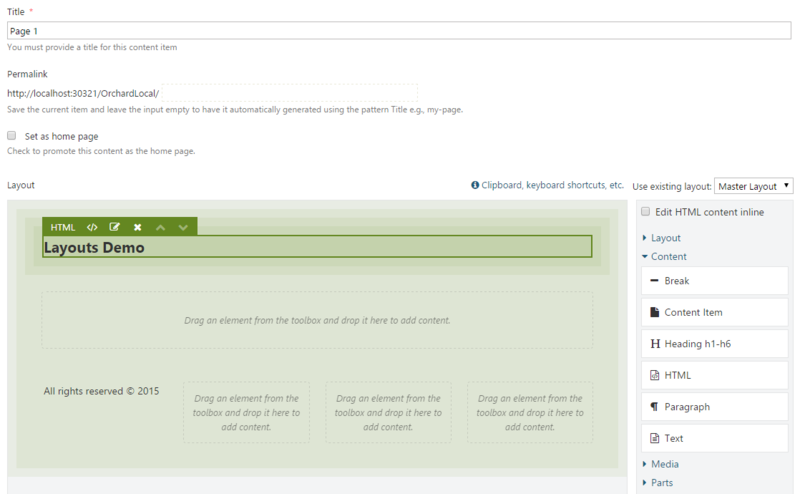 This means ultimate freedom in customizing how an element is rendered in your theme. Element Tokens which enabled elements to be rendered inside of tokenized text fields. A typical scenario is a preconfigured element (Element Blueprint) being rendered inside of a BodyPart. When we first introduced the layouts feature, one of the first questions asked was: "How does layouts relate to zones?" The short answer is: layouts have nothing to do with zones. To clarify further: columns in a layout are not widget zones, and are not intended to "design" your theme. Instead, you use a layout to place elements (optionally using Grid elements) into the local Content zone of a content item. In the first screenshot of this post showing the new homepage, what you see is not the three standard widgets (they have been removed), but simply the Content zone that renders the LayoutPart shape (Parts_Layout). Since the LayoutPart is attached to a content type, the shape created by its driver (Parts_Layout) will be added to the Content shape via Placement.info, just like any other part shape such as Parts_Title and Parts_Common_Metadata, and the Content shape itself is added to the Content global zone. Our of the box, Orchard uses a small CSS file called "default-grid.css", based on custom-grid.css from Sébastien Ros. It's a lightweight CSS file to implement grids without relying on full-blown CSS grid frameworks such as Bootstrap. However, if your theme is using Bootstrap, you most certainly will want to have the LayoutPart render the grid, rows and columns using Bootstrap specific classes. Open the copied Elements/Grid.cshtml file and change the used CSS class name from "table" to the Bootstrap equivalent of "container". Open the copied Elements/Column.cshtml file and change the used CSS class name from "span-" to the Bootstrap equivalent of "col-sm-" for example (use the appropriate viewport size as you see fit). Also change the "offset-" class to "col-sm-offset-", or some other viewport size you prefer. You might also want to get rid of the "cell" CSS class entirely. Get rid of the "default-grid.css" reference from Parts.Layout.cshtml. Instead of overriding the shape templates, you could consider to just "retarget" the "span", "offset" and "table" classes using Bootstrap mixins. Either way is fine and completely up to you. The following is a list of elements that come with the box. Content Item - This element enables you to pick one or more content items to be rendered in-place, using a display type of your choosing. Html - This element enables you to add a snippet of HTML contents to your layout. It's like the Html widget, but intended to be used in layouts. Markdown - This element enables you to add a snippet of Markdown contents to your layout. When rendered, the markdown is turned into HTML of course. This is like the Html widget using the markdown flavor. Paragraph - This element enables you to add a single paragraph to your layout. What sets this element apart from Html and Markdown is that any specified properties such as ID, Css Class and Inline Style are rendered on the <p> tag, whereas for the Html and Markdown elements, these properties are rendered as attributes on a <div> tag. Projection - This element enables you to render a projection anywhere in your layout. It is like the Projection Widget, but intended to be used in layouts. Text - This element enables you to add a snippet of plain text contents to your layout. It is like the Html widget using the text flavor. Image - This element lets you to add an image to your layout by letting you pick an image media item using the Media Library Picker. Media Item - This element lets you pick one or more media items using the Media Library Picker. 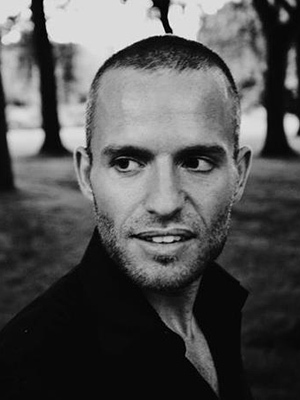 The difference between this one and the Image element is that the Image element is rendered using the <img> element, whereas the Media Item element renders the selected media items using the specified display type. Vector Image - This element lets you to add a vector image to your layout by letting you pick a vector image media item using the Media Library Picker. CommonPart - Lets you add the CommonPart shapes to your layout. Note: the part is rendered using the "Layout" display type - this means that if you want to control which shapes of this part's driver are displayed, you need to define Placement.info rules for the "Layout" display type. TagsPart - Lets you add the CommonPart shapes to your layout. Note: the part is rendered using the "Layout" display type - this means that if you want to control which shapes of this part's driver are displayed, you need to define Placement.info rules for the "Layout" display type. TitlePart - Lets you add the CommonPart shapes to your layout. Note: the part is rendered using the "Layout" display type - this means that if you want to control which shapes of this part's driver are displayed, you need to define Placement.info rules for the "Layout" display type. Grid - This element lets you add a grid to the layout. A grid is composed of rows and columns, much like a Bootstrap grid. Being able to create layouts is fun and creative, but there are times where you need the same layout over and over again and you wish you could somehow reuse some sort of layout template. Well, we have that too. Has the "Use as Template" option checked. The latter is what makes a layout reusable. A mid level row, also with a single, full-width column. A bottom row with 4 equally sized columns. Next, imagine we created three pages, appropriately named: Page 1, Page 2 and Page 3. For each page, we'll add an Html element with a text of something like "Layouts Demo" to the first row, and we'll add some copyright notice to the first column of the last row. Notice that for Page 1, we selected the "Master Layout" as its template and added two HTML elements. We could do the same for "Page 2" and "Page 3". Page 1, 2 and 3 are using the "Master Layout" as their template. Whenever we make a change to this template, that change is reflected across all pages using it. As you can see, the pages using the layout template reflect the changes we just made to that layout template. You could even implement an hierarchy of layout templates where you have a common ancestral layout defining just the layout structure for example, and reusable child layouts defining some content in the form of elements. Content items could use any of these reusable layouts, and a change anywhere in the hierarchical chain will cause all descendants to be updated. Another feature that comes with layouts is Element Blueprints. An Element Blueprint is more or less a preconfigured element based on an existing element. For example, we could define an element called "CompanyInfo" based on the Html element, containing information about our company. We can now reuse this element in all of our pages. We could even create a widget called "CompanyInfo", attach the ElementWrapperPart, and configure it to use our "CompanyInfo" blueprint element. Let's do a quick tutorial to see that in action. The display name is used when presenting the user with available elements. The element type name is a technical name used to uniquely identify an element. 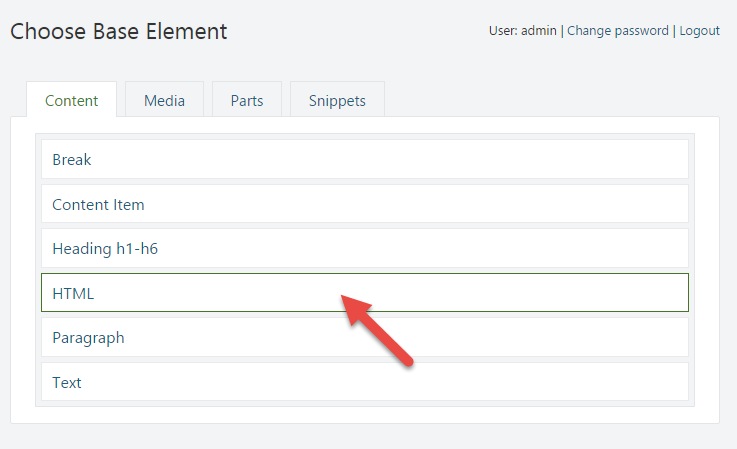 The element category is used when the element is rendered as part of the element toolbox in the layout editor. Next we'll see the element-specific editor. 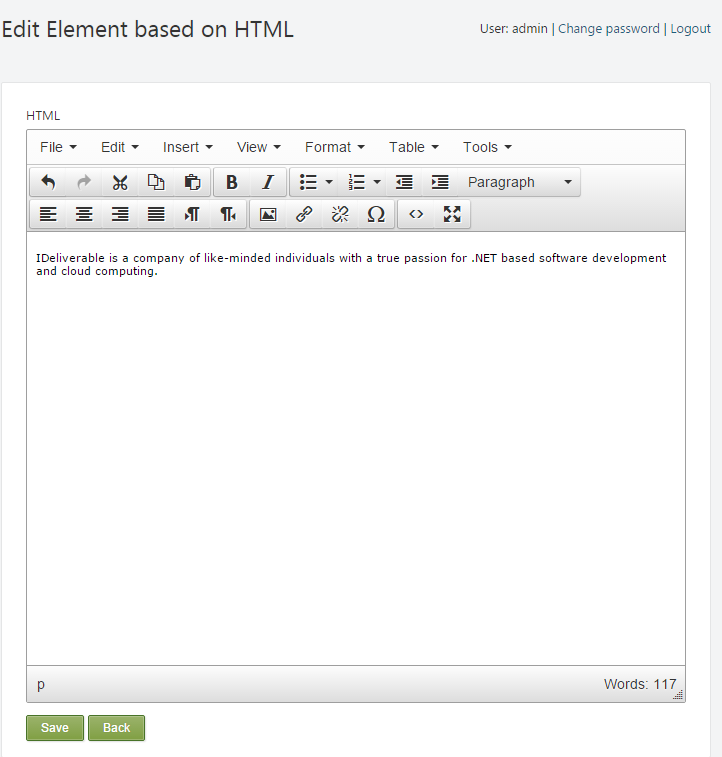 This will be the HTML editor, since we chose the "Html" element as the base element. After hitting Save, we now have our own little "Company Info" element, ready to be used. What's interesting is that no matter how many times you add this element to whatever layouts, whenever you change the blueprint element's contents, those changes will be visible instantaneously. Note: changing a Blueprint element will cause its changes to immediately appear on published pages. Next, we'll turn the "Company Info" element into a widget. To do so, go to Content Definition -> Content Types -> Add, and use the name "Company Info Widget" as the display name and "CompanyInfoWidget" as the technical name. 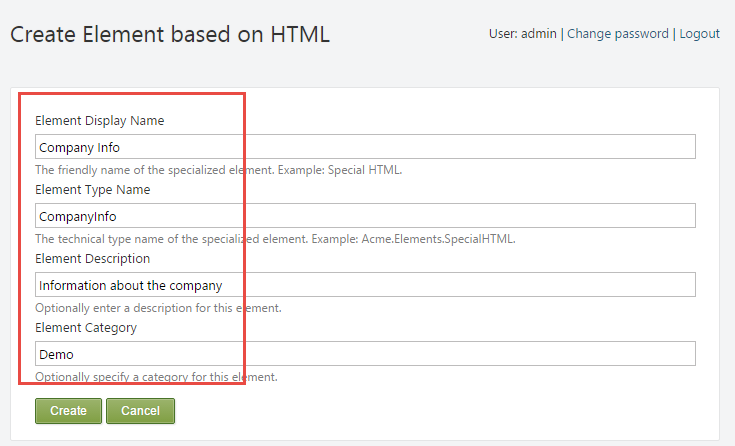 Expand the "Element Wrapper" part settings, and enter the element type name of our "Company Info" element: CompanyInfo and Hit Save to persist the changes. To test this new widget, go to Widgets and add a new widget to the AsideSecond zone of the Default layer, choosing the new "Company Info Widget". You will not see any element specific editor, but when you navigate to the front end, you'll see the new widget shine bright. 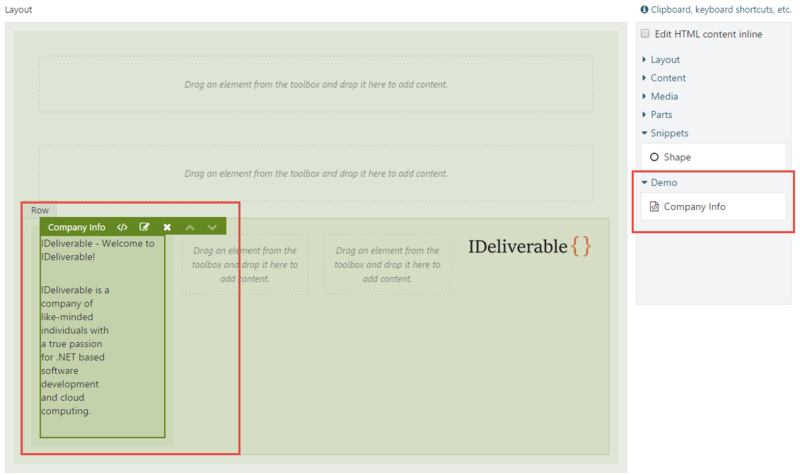 Using element blueprints you can add multiple widgets of the same type without having to duplicate content. Another technique to "reuse" content is to use the "Content Item Widget", which lets you select one or more content items to render in place. This concludes the highlevel overview of the new Layouts feature. I'm very excited about this one with all of its options, flexibility and extensibility. The new Dynamic Forms module leverages Layouts and lets the user compose forms using form elements, effectively turning the layout editor into a forms builder. In the next post, we'll take a look at Dynamic Forms. Initially, I thought the layout templating was supposed to be layouts created via "Manage Layout Content" @ /Admin/Contents/List/Layout but found I couldn't extend those in children the same as templated content. Very helpful article! Also, the fluid element category is an especially nice touch I didn't pick up previously. Thanks! 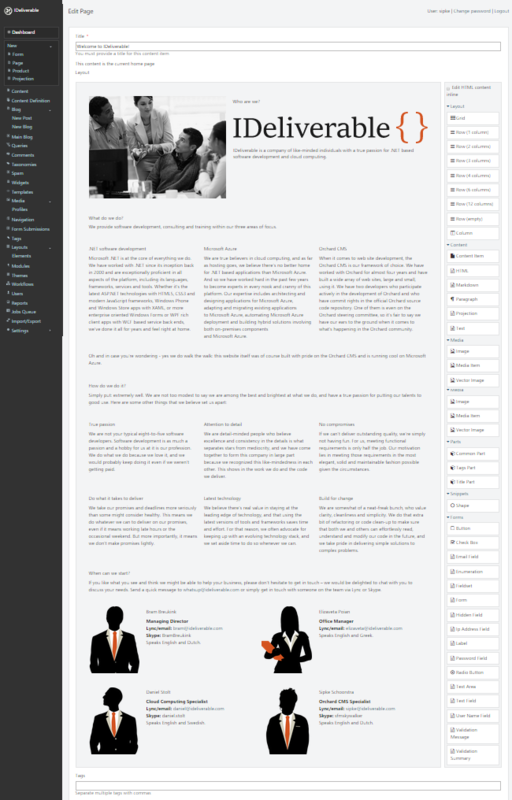 It seems to me that the dynamic layout is more suited for the static websites. I wonder how could we use this great module to build a more dynamic website like you did in your famous webshop tutorial. @Alex - The Layouts feature enables you to put elements onto a canvas, nothing more. When building a webshop, you could use Layouts to place certain commerce elements here and there, but you'd have to write such elements yourself first, and they would add to your commerce module - there's no way you can implement a webshop with just the out-of-box- layout features and no coding. Hope this clarifies a bit. @Sipke, I didn't expect to do it without coding. I tried to use my existing parts and shapes and render them inside the layout. I guess I have to spend more time to understand the concept and find out how to use dynamic layouts. I would appreciate it if you could give us a few hints and point us to the right direction. Anyway, thanks for your effort with this great module. (Daniel, too) Thanks in advance. You mean the Views/Elements/Grid.cshtml and Views/Elements/Column.cshtml? @Sipke Schoorstra, Thank you so much. The Layout feature is powerful. But unfortunately we cannot use it because it is not fully localizable for clients. Please consider this issue specially about this feature because this feature must be available for clients. I am wondering, @Sipke, whether I can completely override the layouts. I am using a bootstrap/angular dashboard. Each section/space has some differences but still uses the container, etc. elements of bootstrap for a grid. Essentially, I want to create separate master layouts for each "space" in the dashboard, which has some unique elements unto itself. Thanks everyone. The examples have been updated. Do u have any workaround for sorting, search and paging features in the Layout - Grid in this 1.9 version. It would be great help, as i am working the same on 1.6 by adding custom content part, but still not completed. Brilliant, this also works great with Zurb Foundation & the appropriate edits to the shapes (row, columns, large-x large-offset-x etc). Thanks for this exciting module. Claire: I think that's a brilliant idea. I'm adding it to our backlog. Please note that today you can define a default JSON string on the content type level for the LayoutPart, whcih will be used as the default layout configuration. We use this for example when creating a new Form content item (Dynamic Forms), which lets you start with an empty Form element and a Submit button. Sorry for what I imagine is a simple question for most to answer. Fairly new to Orchard. How would one extend the elements found in the layout functionality? Specifically I'm trying to create bootstrap elements such as container-fluid or jumbotron. This new layout Feature Looks very promising. 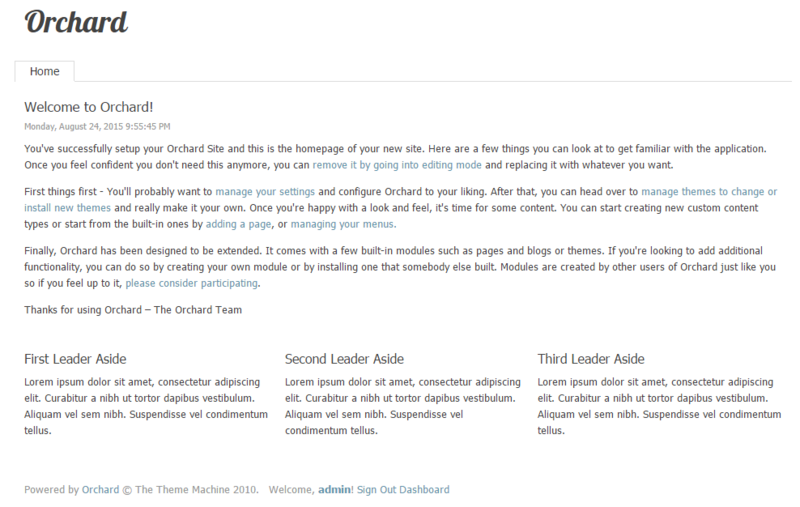 I upgraded my Orchard 1.8 site to 1.9 and enabled the module. Currently my pages have a body and a layout and therefore the concent is rendered twice. Did I miss something during the update of the code? Is there a out-of-the box Migration to convert the Body into a layout? I have been using Layouts intensively for a few days, experimenting with a one-page website theme based on bootstrap and have found it very good. However, I think it could be extended in a few areas: 1. Introduce drag and drop across the hierarchy, not just reordering of siblings. It is extremely tedious to have to reconstruct a complete Grid just because I need to enclose it in another div, for example. 1. Enable tabs to be selectable. It is too hard to click on the border; the tag (Row, Canvas, etc) should be selectable too. 1. Ability to save Layouts and reuse them. BTW: your images have stopped displaying in the tutorial. It sounds like you don't know about the clipboard support - I wish we had made this support more obvious, because a lot of people seem to not find it. But you can actually cut/copy/paste between containers, using the standard keyboard shortcuts. On Chrome (where native clipboard events are supported) you can even do it across browser instances! We figured since this make it easy to move/copy stuff between different containers in the hierarchy, supporting drag/drop move between containers could be descoped. I think I actually tried to do this, but it turned out to be extremely difficult due to the z-ordering or something, I don't quite remember. But I'll look into it again. You can do this with layout templates already. Are you looking for something different? 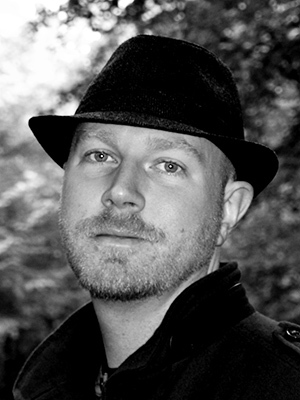 @Matthias: We had a little mishap when migrating from one Azure subscription to another. Sipke is working on restoring the images for this blog post. could the broken image links please get fixed? I have to ask what feels like a dumb question... where IS the content in the editor in 1.9? 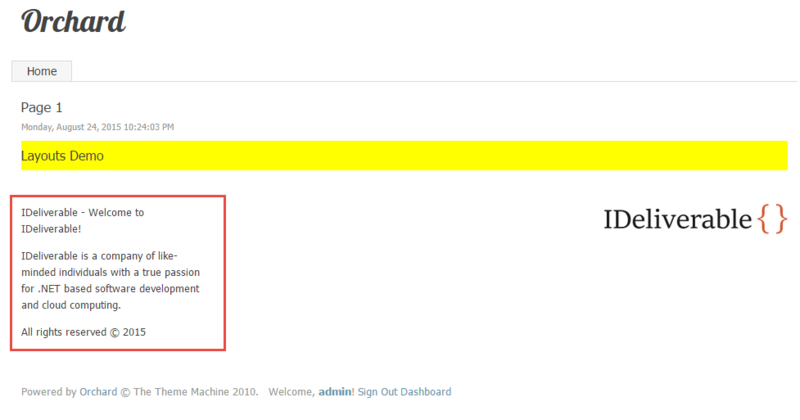 I upgraded my site from 1.8 to 1.9 and when I try to edit a page, everything is blank... even the code view? Do I have to do something to migrate my content to the new layouts? .. Is this something that the theme is responsible for? Any chance that someone can add the images again? Would be very helpful. Thanks! Just to add to the chorus, could we please get the images back on this? I keep coming back to this page when doing google searches and I can't help thinking that a lot of queries would be resolved if the images were there. Can we please fix the images issue. It's difficult to follow the blog without images being displayed. I hope you can fix the images issue as soon as possible. This is helpful article. Also can you please write a blog post about migration from BodyPart to LayoutPart? Is there currently or in future any plans to support exporting layout elements? I'd love to be able to define a recipe that sets up a bunch of commonly used layout elements. Hi how we can use Widget in layout? :( Images are not displayed. Could you please fix it? I've only just discovered this feature because I haven't done any new sites, just upgraded existing sites and that keeps the BodyPart it seems. If its just a tedious case of matching them back up to the folder structure or something and you don't have time to do it maybe somebody from the community can get involved? This site is such a great resource for Orchard its a shame to see it fall into disrepair. Sorry for taking so long everyone. I was finally able to put myself down and restore the images of this post. I appreciate all the kind feedback on the article, thank you! 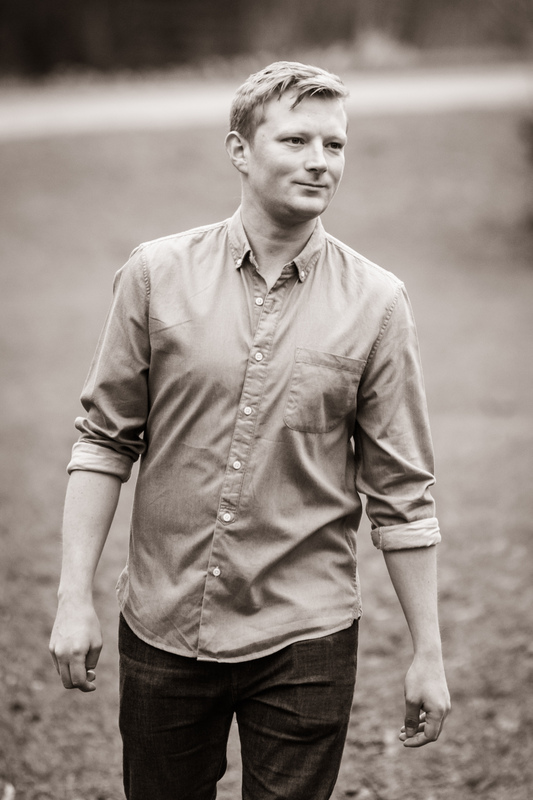 This is a fantatsic accompaniment to your talk at the Orchard Harvest 2015. I found the way it explains the layout feature's relationships with widgets and zones particularly useful. Just need to get this on the Orchard documentation site now ;) Does anyone else find the ".table" class (equivalent of bootstrap's container class) conflicts with bootstrap's ".table" class and cause some strange negative margins? Hi David, you can find those views in the Views folder of the Orchard.Layouts module. This folder consists of a few subfolders, one of them being Elements. You should be able to find them in both the source code version as well as the web package (WebMatrix). Let me know if you're still having issues finding the views you're looking for. When I make a change to an existing layout, even a small change, the results are pretty unpredictable for the pages that already use those layouts. Elements are often moved into other rows/columns. Is there something I should be doing differently? I am trying to use the bootstrap version 4 and updated the Grid.cshtml and column.cshtml and was able to see the correct layout when viewing the page but when editing the page in admin the bootstrap classes is not working. Can anyone help me to fix this issue ?